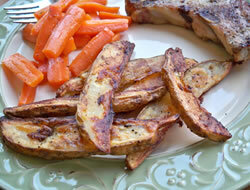 Great side dish of potatoes that is perfect to serve with burgers, steaks, or pork chops. 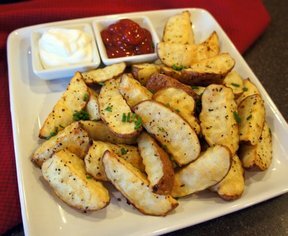 Cut each potato into 8 to 12 wedges, depending on how thick you prefer them. Place in a large bowl or sealable bag. Add the remaining ingredients; toss to coat. Arrange in a single layer in a 15-in. x 10-in. x 1-in. baking pan coated with nonstick cooking spray. 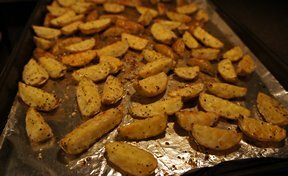 Bake at 425 degrees F. for 20 minutes; turn and bake 25-30 minutes longer or until crisp. 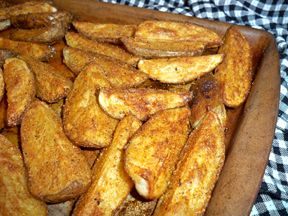 "These potato wedges tasted great and were simple to make but we cut the potatoes in 12 wedges and I think that was a little too thin. Next time I will cut in 8 wedges and bake a little longer."